That question, along with 'isn’t it great working outside with plants?' are probably two of the most common questions you hear when you tell anyone you work in horticulture. As with many things in life, there is never a simple answer, and should you try and explain, the recipients eyes inevitably glaze over. Because of this, I try and keep a stock answer for the favourite plant question for every month, not out of a desire to sell anything (although that’s not a bad thing), but more to make the enquirer happy. This time of year for me there is only one contender - Sarcococca confusa (The Sweet Box or Christmas Box). Unassuming as it looks, it does everything most gardeners required. It’s evergreen, low maintenance, likes a neutral to acid soil, will take the shade as well as some sun, and its defining attribute, has the most fragrant small white flowers of perhaps anything that size. When I wax lyrical about this plant (I try not to, but I can get a little too enthusiastic at times), it’s always the romance of the fragrant flowers by the front door on a cool winters morning which become it’s unique selling point. 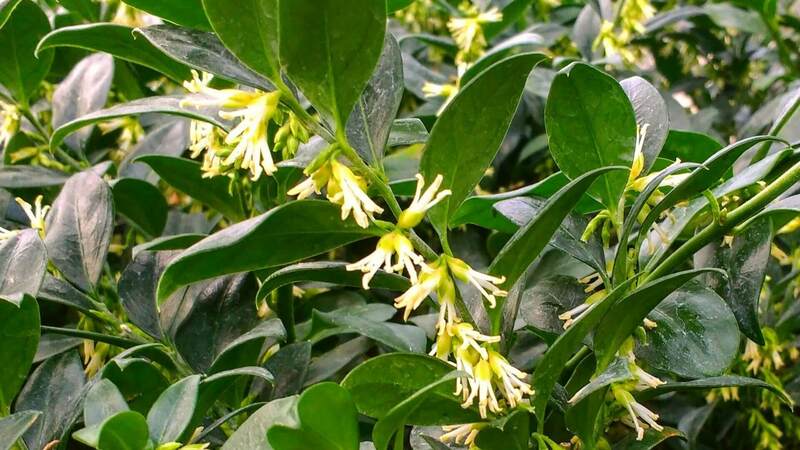 If, as I was some years ago, you’re trapped in a room with the local WI (who were expecting someone else) and a mature Sarcococca, the plants flowers will save you and sell itself. So next time you’re stuck for something to plant in your garden (assuming you go out in the winter), maybe, just maybe, a little ‘romantic’ thought will lead to unexpected delights!